"A Die-struck (Gold on gold) lapel pin is typically a die cut of your design." Die Stamped and usually Sandblasted. Gold plating is the typical but Silver is available too! Discover why Kingpins Gold on Gold Pins are the best choice for many people. KINGPINS offers the best pricing for Gold on Gold Pins. Yes, they are a premium but due to our high volume, we can pass on to you the best prices possible. 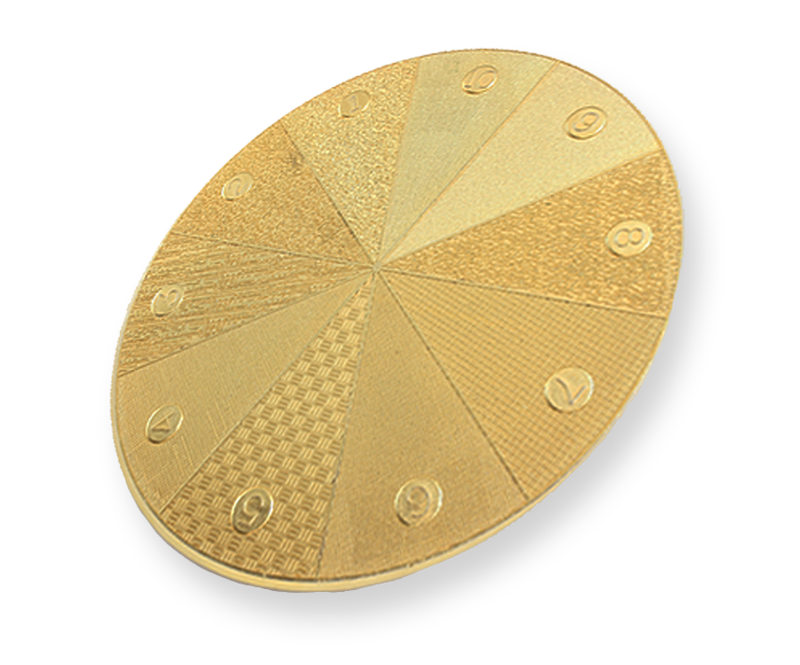 KINGPINS Custom Gold on Gold Pins have a relief finish that is usually sandblasted and highly polished to give a jewellery finish. 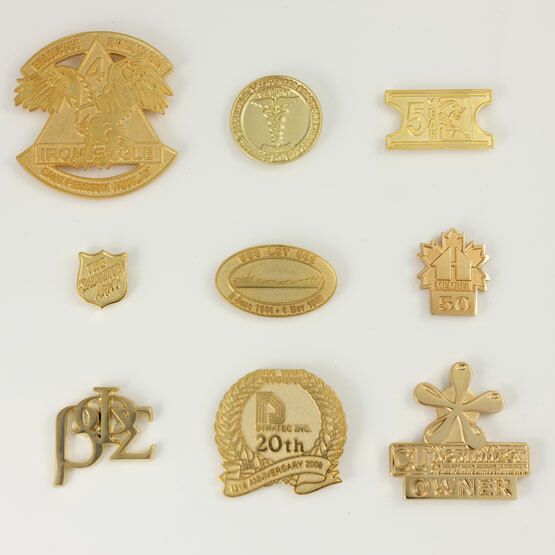 KINGPINS Gold on Gold Lapel Pins are Best-suited for designs with minimal colour and mainly raised and recessed plating. 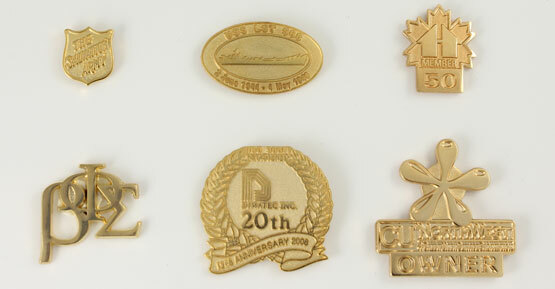 KINGPINS offers the highest quality Gold on Gold pins with either gold or silver plating. Recessed areas can be matte finished or sandblasted. Raised areas are highly polished. Available in any shape and individually poly-bagged. Solid metal die struck pins that are sandblasted and highly polished. How Are Die-Struck (Gold on Gold) Pins Made? Your image is stamped into a sheet of copper. Copper provides the sharpest image and can be highly polished. Plating is done next: for this type of pin the most common is gold on gold (24kt), but other metal platings such as silver, antique bronze, and black oxidized are available. The raised metal surfaces are then highly polished to a luster finish, while recessed areas are usually sandblasted to provide a sharp contrast. Items are inspected twice before delivery: once at the factory, and again by our sales staff before shipping. Kingpins Custom Gold on Gold Pins offer a wide choice in finishes and looks. Have you considered Sandblasting for your custom soft enamel lapel pins? 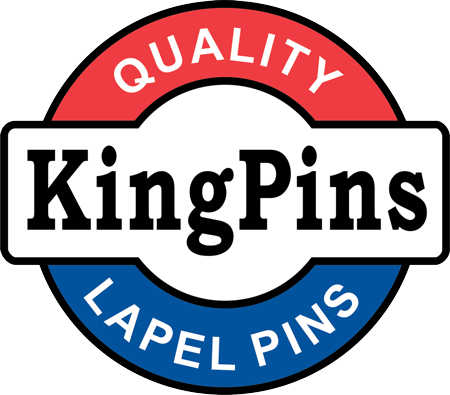 KINGPINS offers a wide range of sand blasting finishes to give you that perfect distinguished look for your custom pin.